X Afrita Hanem (The Genie Lady) Stars Samia Gamal and Farid al-Atrache. X Ahebbak Inte (I Love You) Stars Samia Gamal and Farid al-Atrache. X Akher Kedba (The Last Lie) Stars Samia Gamal and Farid al-Atrache. X Bayaet el Garayed (The Newspaper Seller) Stars Naima Akef. X Dananeer Stars Oum Kalthoum. 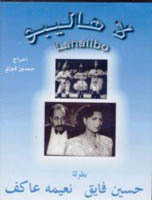 X Ebn Hamido (Son of Hamido) Stars Hind Rostom and Ismail Yasseen. X Fatma Stars Oum Kalthoum. X Gharam fi al-Karnak (Love in Karnak) Stars Mahmoud Reda & Farida Fahmy. X Habib el Omr (Love of a Lifetime) Stars Samia Gamal and Farid al-Atrache. X Hassan wa Naima (Hassan and Naima) Stars Souad Hosni. X Khally Balak Men ZouZou (Pay Heed to Zouzou) Stars Souad Hosni and Hussein Fahmy, with small role by Tahia Carioca. X Lahalibo (The Circus) Stars Naima Akef. X Ma Takulshi La Hada (Don't Tell Anyone) Stars Samia Gamal and Farid al-Atrache. X Mufattish al-Aam, al- (Inspector General) Stars Tahia Carioca and Ismail Yasseen. 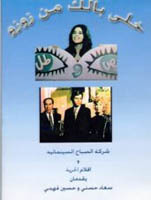 X Safirah Aziza, El (Princess Aziza) Stars Souad Hosni. X Seraa fil Nil (Struggle on the Nile) Stars Hind Rostom and Omar Sharif. X Shatie el Gharam (Shore of Love) Stars Leila Murad, with dancing by Tahia Carioca. X Sigarah wa Kass (A Glass and a Cigarette) Stars Samia Gamal. 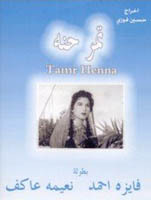 X Tamra Henna (Henna Flower) Stars Naima Akef, Rushdi Abaza, & Ahmed Ramzy. X Umm al Aroussa (Mother of the Bride) Stars Tahia Carioca. X Zouqaq al-Midaqq (Al Maddak Alley) Stars Shadia. 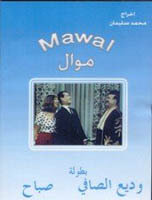 X Mawwal (Song) Stars Nadia Gamal. X Satin Rouge (Red Satin) Stars Hiam Abbass.